This work was performed with the support of a U.S. Environmental Protection Agency interagency funding agreement (EPA/IAG DW 14955347-01-0, Region 9) and cooperative funding agreements with Contra Costa County and Contra Costa Water District. This is a revision of and supersedes U.S. Geological Survey Open-File Report 00-416 (Luoma, S.N. and Presser, T.S., 2000, Forecasting Selenium Discharges to the San Francisco Bay-Delta Estuary: Ecological Effects of a Proposed San Luis Drain Extension, 358 p.). This report is available online in Portable Document Format (PDF). If you do not have Adobe PDF Reader, it is available for free download from Adobe Systems Incorporated. Selenium discharges to the San Francisco Bay-Delta Estuary (Bay-Delta) could change significantly if federal and state agencies (1) approve an extension of the San Luis Drain to convey agricultural drainage from the western San Joaquin Valley to the North Bay (Suisun Bay, Carquinez Strait, and San Pablo Bay); (2) allow changes in flow patterns of the lower San Joaquin River and Bay-Delta while using an existing portion of the San Luis Drain to convey agricultural drainage to a tributary of the San Joaquin River; or (3) revise selenium criteria for the protection of aquatic life or issue criteria for the protection of wildlife. Understanding the biotransfer of selenium is essential to evaluating effects of selenium on Bay-Delta ecosystems. Confusion about selenium threats to fish and wildlife stem from (1) monitoring programs that do not address specific protocols necessary for an element that bioaccumulates; and (2) failure to consider the full complexity of the processes that result in selenium toxicity. Past studies show that predators are more at risk from selenium contamination than their prey, making it difficult to use traditional methods to predict risk from environmental concentrations alone. This report presents an approach to conceptualize and model the fate and effects of selenium under various load scenarios from the San Joaquin Valley. For each potential load, progressive forecasts show resulting (1) water-column concentration; (2) speciation; (3) transformation to particulate form; (4) particulate concentration; (5) bioaccumulation by invertebrates; (6) trophic transfer to predators; and (7) effects on those predators. Enough is known to establish a first-order understanding of relevant conditions, biological response, and ecological risks should selenium be discharged directly into the North Bay through a conveyance such as a proposed extension of the San Luis Drain. The approach presented here, the Bay-Delta selenium model, determines the mass, fate, and effects of selenium released to the Bay-Delta through use of (1) historical land-use, drainage, alluvial-fill, and runoff databases; (2) existing knowledge concerning biogeochemical reactions and physiological parameters of selenium (e.g., speciation, partitioning between dissolved and particulate forms, and bivalve assimilation efficiency); and (3) site-specific data mainly from 1986 to 1996 for clams and bottom-feeding fish and birds. Selenium load scenarios consider effluents from North Bay oil refineries and discharges of agricultural drainage from the San Joaquin Valley to enable calculation of (a) a composite freshwater endmember selenium concentration at the head of the estuary; and (b) a selenium concentration at a selected seawater location (Carquinez Strait) as a foundation for modeling. Analysis of selenium effects also takes into account the mode of conveyance for agricultural drainage (i.e., the San Luis Drain or San Joaquin River); and flows of the Sacramento River and San Joaquin River on a seasonal or monthly basis. Load scenarios for San Joaquin Valley mirror predictions made since 1955 of a worsening salt (and by inference, selenium) build-up exacerbated by an arid climate and massive irrigation. The reservoir of selenium in the San Joaquin Valley is sufficient to provide loading at an annual rate of approximately 42,500 pounds of selenium to a Bay-Delta disposal point for 63 to 304 years at the lower range of projections presented here, even if influx of selenium from the California Coast Ranges could be curtailed. Disposal of wastewaters on an annual basis outside of the San Joaquin Valley may slow the degradation of valley resources, but drainage alone cannot alleviate the salt and selenium build-up in the San Joaquin Valley, at least within a century. Load scenarios also show the different proportions of selenium loading to the Bay-Delta. Oil refinery loads from 1986 to 1992 ranged from 8.5 to 20 pounds of selenium per day; with treatment and cleanup, loads decreased to 3.0 pounds of selenium per day in 1999. In contrast, San Joaquin Valley agricultural drainage loads disposed of in a San Luis Drain extension could range from 45 to 117 pounds of selenium per day across a set of historical and future conditions. Components of this valley-wide load include five source subareas (i.e., Grassland, Westlands, Tulare, Kern, and Northern) defined by water and drainage management. Loads vary per subarea mainly because of proximity of the subarea to geologic sources of selenium and irrigation history. Loads from the Sacramento River, depending on flow conditions, range from 0.8 to 10 pounds of selenium per day. Loads from the San Joaquin River vary depending on restoration and flow conditions, which are considered. A consistent picture of ecological risk emerges under modeled selenium discharges from a proposed San Luis Drain extension. The threat to the estuary is greatest during low flow seasons and critically dry years. Where selenium undergoes reactions typical of low flow or longer residence time, highly problematic bioaccumulation in prey (food) is forecast. Surf scoter, greater and lesser scaup, and white sturgeon appear to be most at risk because these Bay-Delta predators feed on deposit and filter-feeding bivalves. Recent findings add Sacramento splittail and Dungeness crab to that list. During the low flow season of critically dry years, forecasted selenium concentrations in water, particulate matter, prey (diet), and predator tissue exceed guidelines with a high certainty of producing adverse effects under the most likely load scenario from a proposed San Luis Drain extension. High flows afford some protection under certain conditions in modeled San Joaquin River scenarios. However, meeting a combined goal of releasing a specific load during maximum flows and keeping selenium concentrations in the river below a certain objective to protect against bioaccumulation may not always be attainable. Management of the San Joaquin River on a constant concentration basis also could create problematic bioaccumulation during a wet year, especially during the low flow season, because high flows translate to high loads that are not always offset by seasonal river inflows. Prior to refinery cleanup, selenium contamination was sufficient to threaten reproduction in key species within the Bay-Delta ecosystems and human health advisories were posted based on selenium concentrations in tissues of diving ducks. During this time, selenium concentrations in the Bay-Delta were well below the most stringent recommended water quality criterion [1 microgram per liter (1 µg/L)]. Enhanced biogeochemical transformations to bioavailable particulate selenium and efficient bioaccumulation by bivalves characterized the system. If these biogeochemical conditions continue to prevail and agricultural selenium sources replace or exceed refinery sources, ecological forecasts suggest the risk of adverse effects will be difficult to eliminate under an out-of-valley resolution to the selenium problem. The Bay-Delta selenium model presented here is a systematic approach for conducting forecasts of the ecological effects from selenium on aquatic food webs. It is a new tool that links and models the major processes leading from loads through consumer organisms to predators. It also is a feasible approach for site-specific analysis and could provide a framework for developing new protective selenium foodweb guidelines and predator criteria. Model components that help ensure understanding ecosystems and the basis of environmental protection are (1) contaminant concentrations and speciation in sources, such as particulate material, that most influence bioavailability; (2) bioaccumulation models that calculate concentrations in diet, specifically in bivalves of the Bay-Delta that act as sensitive indicators of selenium contamination; (3) food-web type that determines what animals are threatened and when; and (4) multiple media concentrations (water, particulate material, and tissue of prey and predators) that, in-combination, determine risk or hazard. 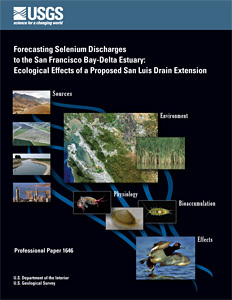 Presser, T.S., and Luoma, S.N., 2006, Forecasting selenium discharges to the San Francisco Bay-Delta Estuary; ecological effects of a proposed San Luis Drain extension: U.S. Geological Survey Professional Paper 1646, 196 p. [https://pubs.usgs.gov/pp/p1646/]. Document Accessibility: Adobe Systems Incorporated has information about PDFs and the visually impaired at Adobe Access. Send questions or comments about this report to the authors, Theresa S. Presser, (650) 329-4512 or Samuel N. Luoma, (650) 329-4481. Visit the Toxic Substances Hydrology Program Web page.